Rare trade card featuring a team photo of the 1888 Detroit Wolverines. Sixteen uniformed players are pictured in a formal studio setting, including Hall of Famers Deacon White, Ned Hanlon, Dan Brouthers, and Sam Thompson. The team name and year, "Detroit Base Ball Club 1888" are printed on an illustrated scroll at the base. Advertising for "Wm. 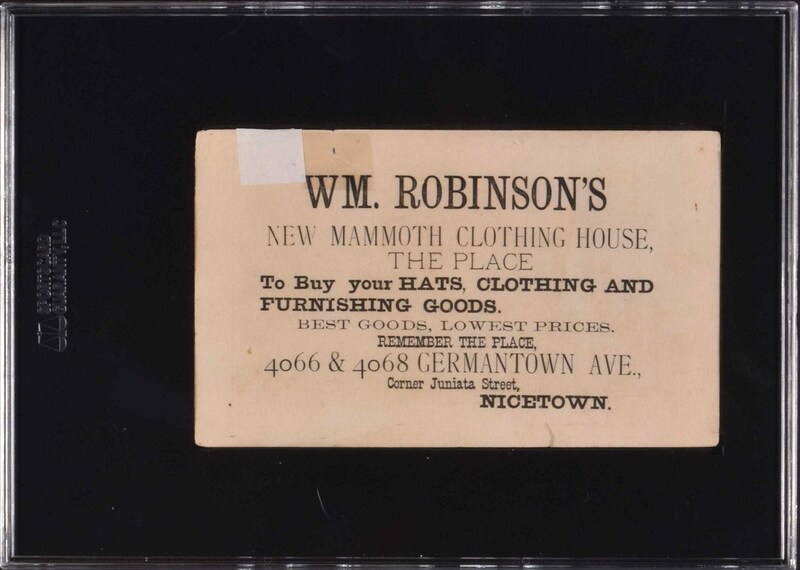 Robinson's New Mammoth Clothing House" of Philadelphia, Pennsylvania, appears on the reverse. This is the first example of this trade card we have seen, but the photo itself is a well-known image taken by noted photographer Joseph Hall. The Detroit Wolverines were one of the National League's top clubs during the late 1880s. 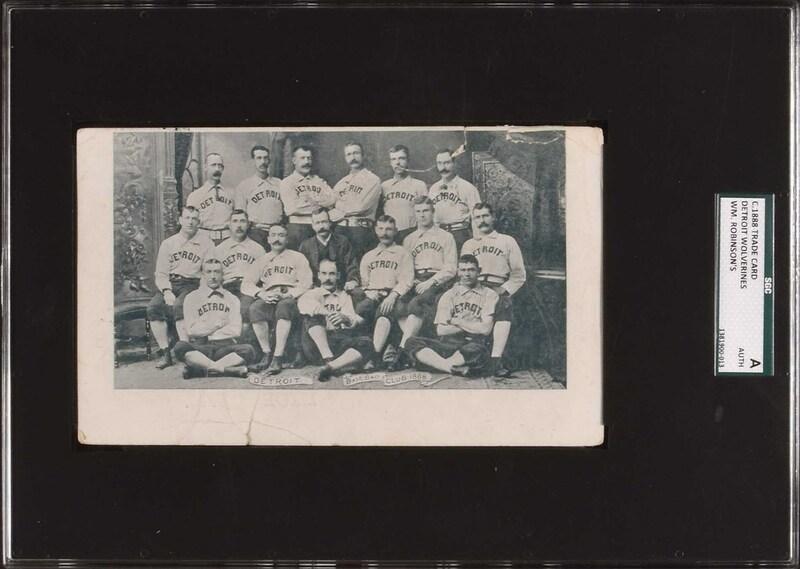 In 1887 the team captured its only pennant in franchise history and then went on to defeat the American Association champion St. Louis Browns ten games to five in what is still the longest World Series ever played: a best-of-fifteen series played in ten different cities. Detroit actually clinched the Series 8-3 after Game 11; however, the teams played out the remaining four games for the fans (and the gate receipts, no doubt), and the Wolverines are officially credited today with a 10-5 World Series victory. As strong as the club was in 1887, Detroit was not a strong market at the time and the franchise, which began in 1881, folded after the 1888 season. The trade card (7 x 4.25 inches) displays two moderate tears along the top border, both of which have been repaired with clear tape on the reverse. An additional small tear affects the bottom border. A few light-to-moderate creases are also evident, mainly in the perimeter areas. Technically in Poor to Fair condition, but it presents at a higher level than that suggested by its technically accurate grade. Encapsulated by SGC and certified as "Authentic." Reserve $1,000. Estimate (open).